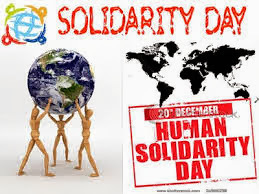 GENEVA (18 December 2014) – Following is a message by the United Nations Independent Expert on Human Rights and International Solidarity, Virginia Dandan, to mark the International Human Solidarity Day, which will be commemorated on 20 December 2014. “International Human Solidarity Day, launched in 2006, celebrates humankind, its courage and its enduring capacity to prevail despite all odds. The United Nations Development framework, as articulated in the UN world conferences and summits since the 1990s, is itself rooted in principles of international solidarity. UN member States are once again negotiating a new sustainable development agenda which will likely include the creation of measureable Sustainable Development Goals. World leaders have one year to seize that unique opportunity to re-imagine and create a global dynamic where people are at the centre of development in order to end poverty in all its forms. ‘We, the peoples of the United Nations,’ must unite as a global community, calling on our governments to ensure that the processes and outcomes of the new agenda, are consistent with international human rights standards and norms, to be enjoyed by all, and leave no one behind*. On this day, I call on Governments, civil society and all crucial stakeholders to actively participate in creating this transformative shift in development. Solidarity, should, and must be a positive force in the lives of people and of nations, but we must be vigilant and protect the bonds that link us together. To build a better future requires everyone to work, together and as one. Sustainable development requires international solidarity not only among the Governments of the world, but also among the peoples of the world, to actively participate in this project of building a better world. All of us have a stake in the future.